The CW Group announces the release of Issue 12 of CemWeek Magazine. This issue’s feature article, “Value Engineering as a Strategic Mode,” proposes a CW Group’s strategic Energy Model framework that addresses the broad topic of energy for cement companies. 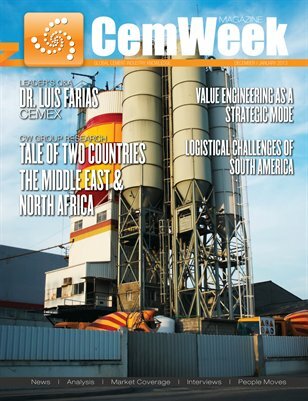 “Logistical Challenges of South America” offers an overview of transportation challenges encountered in this particular region by cement manufacturers. The Leaders Comment section includes an interview with the VP for Energy and Sustainability at global-leader CEMEX, Dr. Luis Farias.